The Folklore Museum is housed in a cave house built in 1861 in Kontochori - Fira. The museum is an old winery with workshops for carpenters, barrel makers, shoemakers and tinsmiths and an art gallery. There is also a library. 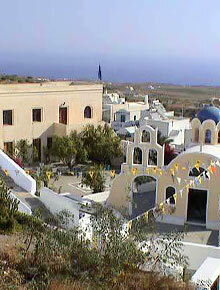 Within the grounds one can discover the chapel of Agios Konstantinos with its belfry and festivities room. The garden and courtyard offers seating areas amongst trees and flowers. The Folklore Museum was founded by Emmanuel A. Lignos, laywer, journalist and Director of the monthly newspaper ¨Theiraic News¨.